Is the government-controlled SBI (State Bank of India) bending the RBI rules to save the troubled Jet Airways? The discrepancy in the RBI's circular last February and Jet Airways' debt resolution note seems to suggest so. "Conversion of lenders' debt into 11,40,00,000 shares of Rs 10 each by allotment of such number of equity shares to the lenders that would result in the lenders becoming the largest shareholders in the company. Such allotment of 11,40,00,000 shares will be made at an aggregate consideration of Re 1 since under the RBI circular, lenders can convert debt into equity at Re 1 when the book value per share of a company is negative," said the Jet note. As on March 20, Jet's book value was (negative) Rs 919.94 crore. On the other hand, RBI's circular in February 2018-Resolution of Stressed Assets - Revised Framework-says that "equity instruments, whether classified as standard or NPA, shall be valued at market value, if quoted, or else at break-up value as ascertained from the company's balance sheet as on March 31 of the immediate preceding financial year. In case balance sheet as on March 31 of the immediate preceding financial year is not available, the entire portfolio of equity shares of the company held by the bank shall be valued at Re 1." The same circular also mentions that companies that default on loans have to submit a resolution plan within 180 days or file for bankruptcy. In December, Jet defaulted on its debt payments. Jet, being a listed company, has to prepare its balance sheet in a timely manner. It seems that SBI doesn't want to throw any more money after Jet while, at the same time, it wants to take control of the airline. But why would SBI, which has loaned about Rs 2,000 crore to Jet, want to save Jet instead of recovering money through the IBC (bankruptcy) route. Jet going for bankruptcy would mean thousands of job losses; and it would send the aviation sector into a tailspin. For an election-bound government, saving Jet is crucial because no government would want a trained workforce of 16,000-odd people to lose jobs overnight. The question is no longer whether SBI and its lender partners can turnaround the airline after taking control-because lenders' track record in reviving troubled assets has been fairly poor. There's a lot more at stake for the ruling NDA government if Jet goes insolvent. 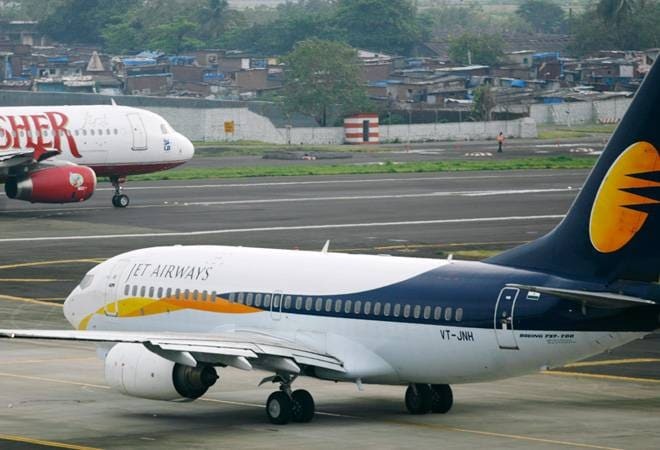 The resolution plan is still waiting approval from key stakeholders, including Etihad Airways (which owns 24 per cent equity in Jet) and Jet chairman Naresh Goyal. Aviation veterans have already called the resolution plan as the 'backdoor entry' for the government, and the opposition parties have latched on to the Jet's predicament to score brownie points. On Wednesday, Congress party spokesperson Randeep Surjewala said that SBI and other banks like PNB, Canara and Allahabad Bank are now being used by PM Narendra Modi to bailout a bankrupt private company. He further said that directing the NIIF (National Infrastructure Investment Fund) to buy Etihad Airways' 24 per cent stake at Rs 150 per share is being done without any independent financial valuation or due diligence of Jet. "Private players will walk away happily, while the government of India and PSU banks will be now running a bankrupt private airline," Surjewala said. So while Jet's lenders are avoiding bankruptcy, experts argue that IBC route is better for them than going for a resolution plan. "The alleged government's interference would at best give a short lifeline to the struggling carrier," says an aviation consultant. A legacy carrier, Jet is sitting on some valuable assets-16 owned planes which are worth $400 million, Jet Privilege program, and landing & parking slots in key cities-that can be either easily monetised by its lenders (under IBC) or makes the airline an attractive option for the potential buyers. Tata Group, which had evinced interest in buying Jet some months ago, allegedly wanted Goyal before they take the driver's seat at Jet. They wanted to derive synergies between Vistara and Jet, which needed Goyal to hand over the reins. With a plenty of differences emerging among its key stakeholders, the future of Jet has never been as uncertain.